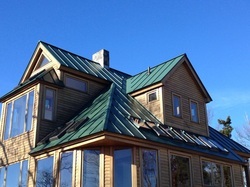 Standing seam metal roofing can be installed on simple or complex roofing systems. It has crisp lines and unbroken panels from ridge to eve to ensure maximum weathertightness. 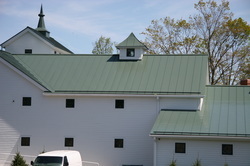 Standing seam metal roofing panels are formed with a rollformer. They can be shop fabricated, but more often it is done right on the job site. 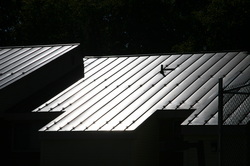 A variety of metals can be used to rollform roofing panels. Copper, aluminum, galvalume steel are the most common. Coated with high quality architectural finishes, these rich and vibrant colors are produced with either Kynar 500 or Hylar 5000 resins, which provides superior color retention. Metal shingles are being installed in over 80 countries. New technology in acrylic priming, the superior corrosion resistance of Zincalume (a zinc/aluminum alloy-coated steel) and interlocking panels provide a weathertight barrier against the elements. These 26-gauge stone coated shingles have a 50 year warranty. They come in many different styles and colors and are lightweight (1.5 lbs per square foot). An alternative to the standing seam metal roof is stone coated steel roofing. Metal roofing shingles are a new and exciting system designed to uphold the conventional shingle look while providing the durability of metal. Whatever the design, naturally weathered, full-colored, or traditional shingled appearance, Walker & Company can assist you and your design force in determining the right application.